Today I said two goodbyes. I participated in the Hotshots 19 workout, and as part of the community said goodbye to 19 brave firefighters who have their lives for their community. We also said goodbye to Lemon, our four year old Boston Terrier. We found her a good home, she will be well loved and cared for. She's a great girl who has the family she deserves. Taught two hours of class. Row, 50 UB double unders & mobility. 3 rds, 1:00 rest after each. It too early for this old man. Don't miss the grenade. Word. 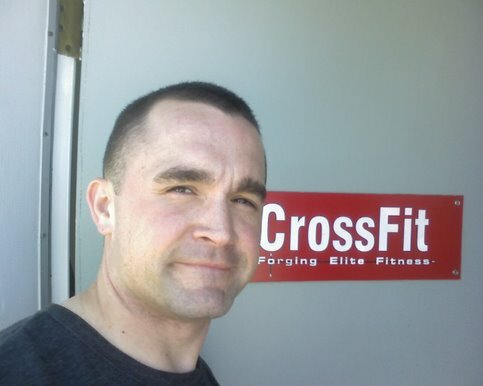 At 1330, went to the pool for two swim WODs. Five minutes on the air dyne bike to warm up. Then 3 sets of 3 squat cleans, touch and go @160. 5:00 row to cool down, 1104 @2:10 pace. Bike to the pool for a warm up. Some swim practice: skulling drills and brick carrying technique. Ran in boots for a warm up, got to get ready for the CFT. Birthday burpees-raced a two man team, they each did 19, I did 38, they only beat me by 1. Forget to blog? I'm forgetting whole days. Can't remember if I even worked out Wednesday, but I know I didn't on Thursday or Friday. I recently bought off in a great idea: take part in a real life competitive event. 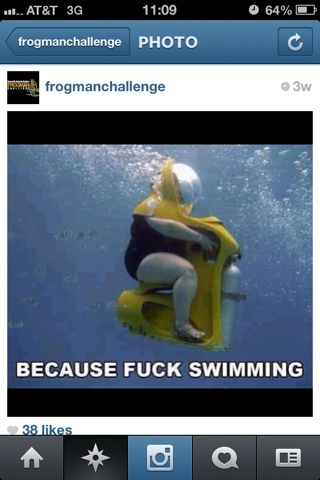 Only one problem--it's a day full of wods that all involve a swim, known as the Frogman Challenge. I've been training for it. Really, I have. But I took a long lapse from blogging about training. My excuses are legendary, bards will sing of my ability to procrastinate and my petty injuries for all ages. But I need to get back on task and record my training, if for no other reason than to--gasp--improve my methods. Dive-25m-wall turn-25m-down/up-5 wall up&outs-10 air squats. 5+ rds, googles popping off, not fluid, need work all over, improving.